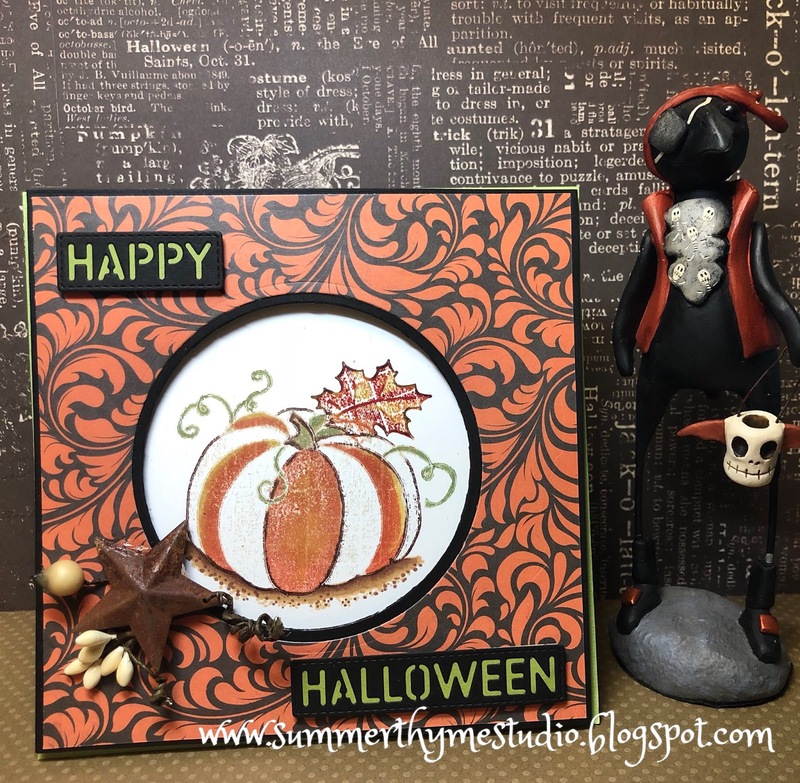 Once I stamped it, I just kept adding various colours to the image in small amounts and stamping over and over with the Misti until I got the desired effect. Be sure to visit the IO Blog to enter your project and to see which of the talented DT are participating today!!! 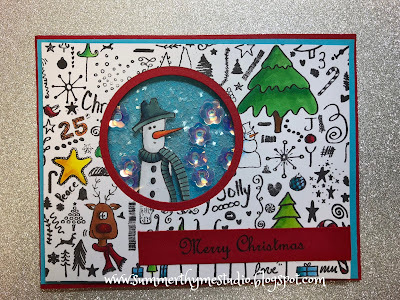 Christmas Whimsy with Technique Junkies Stamps! Christmas is coming sooner than we know and it sure felt like it when I left work today. BRRRRRR!!!!! 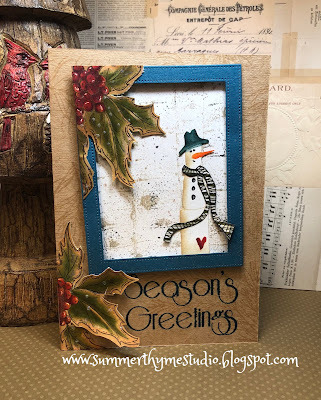 I used my circle die cuts to make a window in the background, adding an acetate window and adhering the snowman to it. I used some foam tape in behind to crate a shaker box. I I didn't want my cut out to go to waste, so I created a clean and simple card using it. 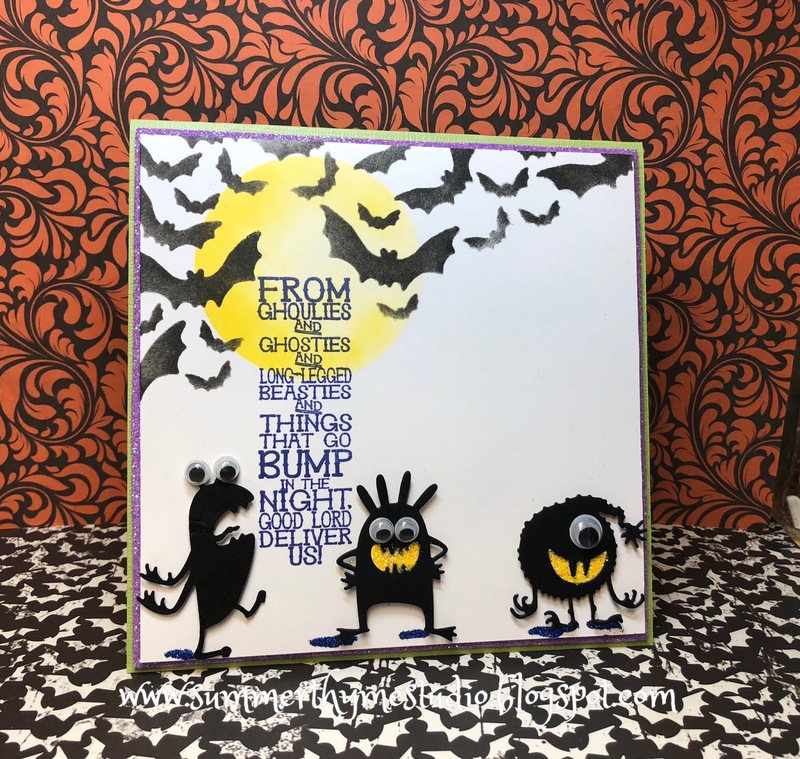 Both fun cards to make!!!! 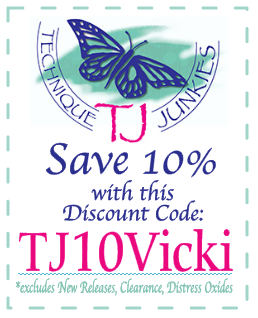 and here's a code for a little discount!!! I will take some time today to create, between getting things ready for our Thanksgiving Dinner tomorrow. 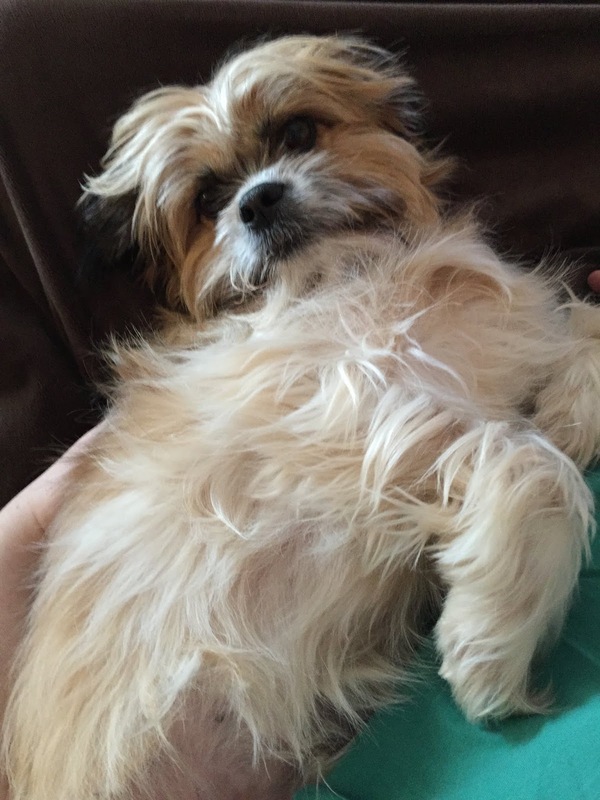 As I'm typing, I can hear little Sydney "talking" in her sleep. She makes the sweetest noises when she is dreaming, especially the little barks. 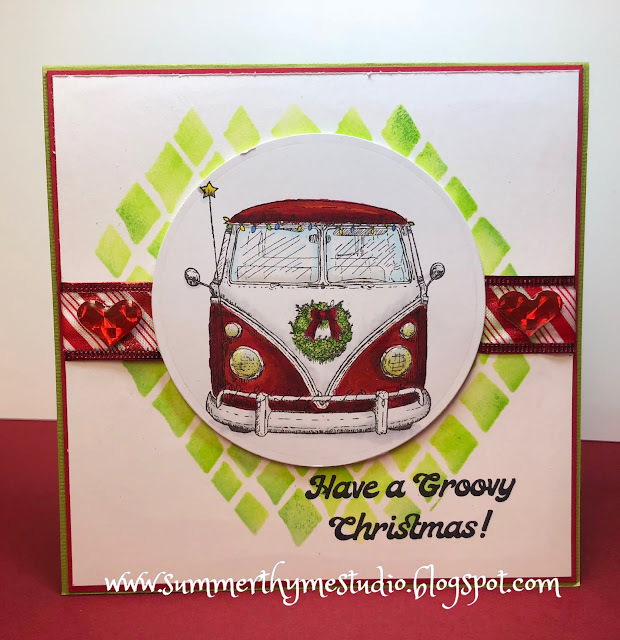 I created this card with the newly released stamps from Technique Junkies. To make this card I started by adding some Pine Sprays to the card base with images from the Season's Greetings Stamp set. I coloured up the Holly Images from the same set with Copic Markers and cut them out to use on my card. I made the Background using the Birches background and Tan and Mist Ink from Impression Obsession I then sprayed the Birch Trees with Mixed Metals shimmering bliss. It's hard to see her, but the shimmer is so pretty!!! 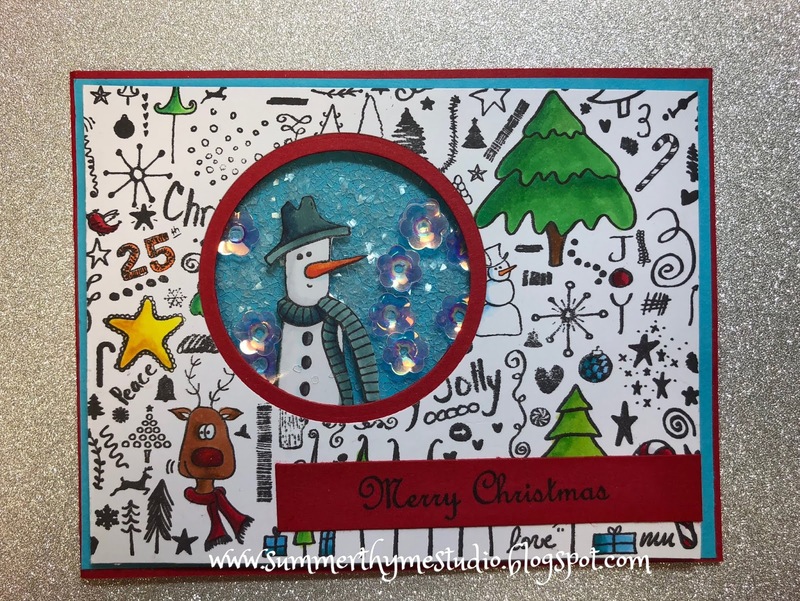 I stamped the Snowman Whimsy Stamp and coloured him with Copic Marker and used paper piecing for his scarf. Lastly, I assembled it all and was so pleased with the results!!!! Note: The discount doesn't apply to Bundles!!!! I sure hope you have a wonderful weekend!!!! 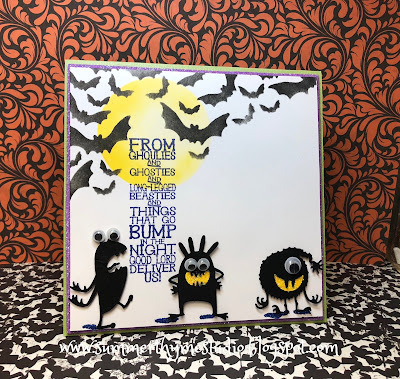 Im a day late to the challenge, but I wanted to share my fun sparkly Halloween card with you! Be sure to link your project up on the IO Blog for a chance to win a gift certificate! Here's who else is playing today! 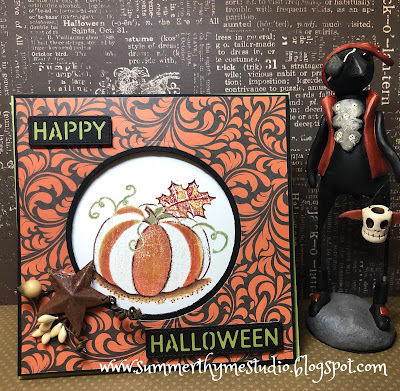 Cindy, please email me at summerthymestudio@gmail.com for your coupon code before October 4th. It's that time again!!! TIme to showcase some new RUBBAH!!!!! These two images screamed Vintage to me!!! For my first card, I must confess I searched Pinterest for Vintage Christmas Cards to get some ideas! 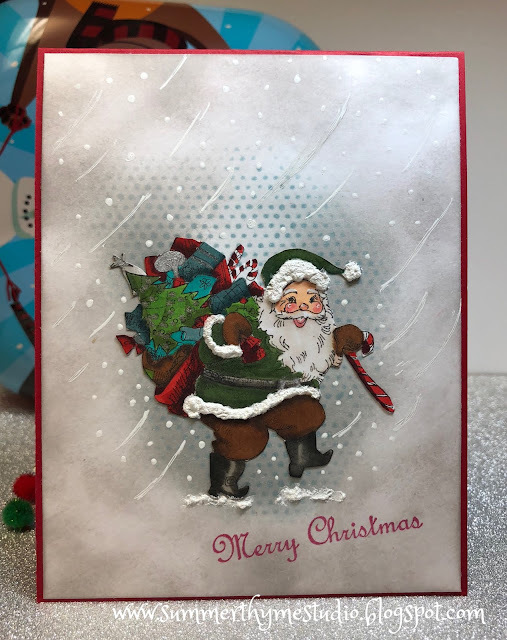 I coloured Santa with Gifts with Copic Marker after creating a little background with a colorful life grunge dot stencil and denim coloured ink. I actually cut my coloured image out and glued it to the middle of the card. This jolly little Santa reminds me of a 1950's style card. My Grandmother saved all of her cards, so I've seen many vintage cards in my day!!! Moving forward a decade or two, we've got a V dub!!! Peace and Love man!!! I just adore this sweet image and sentiment!!! I coloured the image with Copic and jazzed the card up with a little ribbon and some stencilling with the Wonky Harlequin Super Fun!!! All of the New Release Stamps are on Sale for the next little bit ! 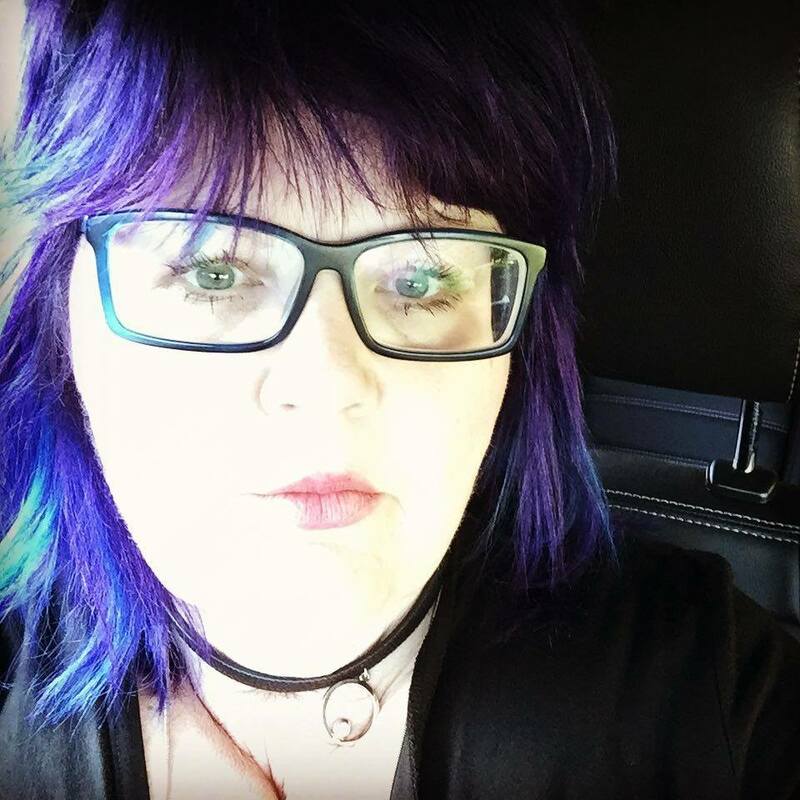 Now head on over to Jeanne's Blog because I know she has some awesome Eye Candy for you!